Lillian is small for her age and actually wore these jeans at the end of last winter. Because of that, the knees were wearing out and starting to get holes in them. 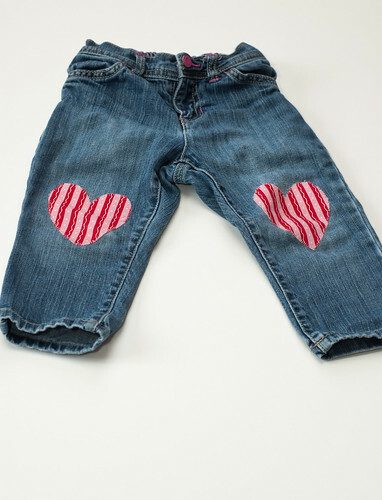 They still fit so I didn’t really want to throw them away, so instead, I decided to add heart patches to the knees. I chose my fabric, then cut out hearts. After that, I decided that the best way to attach them would be to applique them. 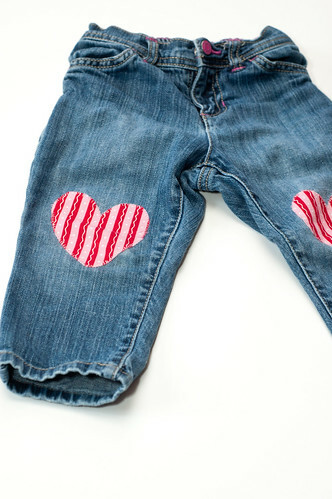 I then cut out hearts out of the Heat n’ Bond Lite, and ironed them onto the fabric hearts. This is backwards so I suggest not to do it this way. If you aren’t sure how to applique you can check out my post here. 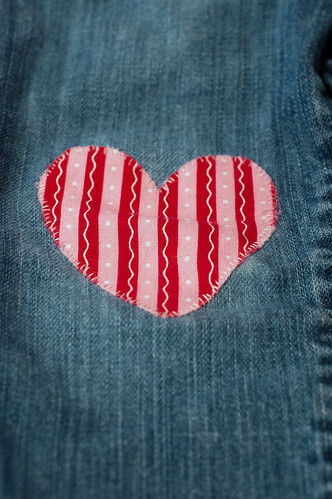 From there, I had to hand stitch the hearts onto the jeans because they are so little that they wouldn’t fit into my machine. I might have been able to tackle it with a lot of maneuvering but it wasn’t worth it to me. I realize that these probably won’t last too long because Lillian will probably wear right through the fabric but that is ok. They are cute and will be perfect for Valentine’s Day. Love the heart patches!! 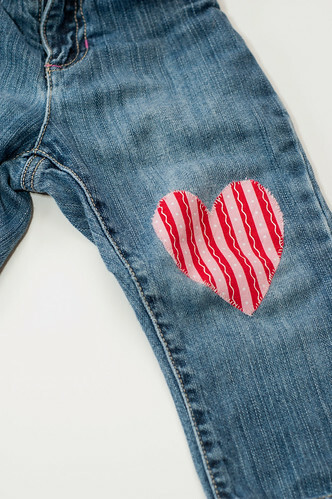 Perfect way to upcycle a pair of pants!